ArcticShield Performance Fit II Jacket with X-System Lining. Our ArcticShield Performance Fit II Jacket is constructed of an ultra-quiet, bur-free micro suede shell and contains our ArcticShield technology utilizing a multi-layered heat retention material to capture and return up to 90% of your body heat back to you. In addition, our X-System anti-odor technology throughout the jacket and bib controls your scent, making it easy to sneak up on your game. The jacket and bib are versatile enough to use during early-season bow hunts to late season muzzle loading. The high-performance jacket comes complete with an abundance of pockets to keep gear close at hand and also features an interior zippered removable snow skirt to help keep out the cold and removes easily when not needed. Two hand warmer cargo pockets with snapped storm flaps, two zippered ventilating pit zips for extra airflow when needed, draw cord waist, and a water resistant front zipper to keep rain out. 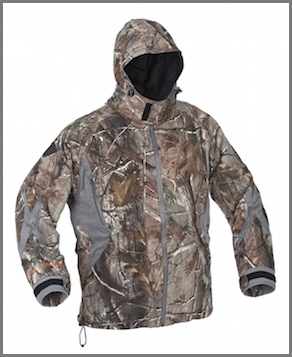 The jacket offers a clean front making it more convenient when shouldering a gun or drawing your bow. The internal carry strap allows you to carry your jacket on your back when the temperatures warm up during the day or keep out of your way when carrying out your game.